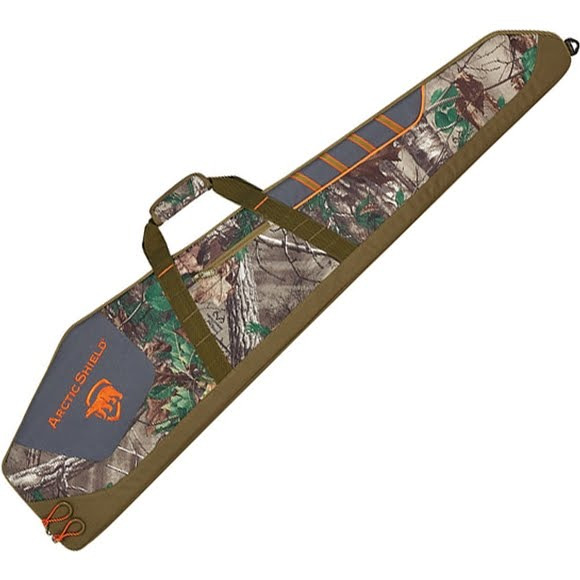 The ArcticShield G4X Realtree Xtra¨ Rifle Case from Onyx features a heavy-duty polyester shell. A dual density foam padding system creates the best protection for your firearm. This case has a wrap handle with hook/loop closure, and an adjustable shoulder strap. A d-ring hanging loop, heavy-duty full length two-way zipper, and a side accessory pocket are included as well. The ArcticShield G4X Realtree Xtra¨ Rifle Case from Onyx features a heavy-duty polyester shell. A dual density foam padding system creates the best protection for your firearm. This case has a wrap handle with hook/loop closure, and an adjustable shoulder strap. A d-ring hanging loop, heavy-duty full length two-way zipper, and a side accessory pocket are included as well. Fold-flat design allows for use as a mat. Our new ArcticShield technology conquers cold by capturing and returning up to 90% of your body heat. This patented technology utilizes a multi-layered heat retention material that captures body heat and lets you enjoy the thrill of the hunt, instead of the chill of the hunt. This technology allows you to be warm and comfortable in temperatures ranging in the 50&apos;s to well below zero.